In 2003 the Studio of Canadian Wood Craftsman commissioned a 19th Century Farmhouse Kitchen in a gorgeous and unspoiled field stone farmhouse in Grey County, Ontario. These farmhouse kitchens present a very problematic situation for more modern kitchen cabinet designs highlighting long runs of counter space. Large farmhouse windows coming low to the floor and 2 to 3 doors exiting these large rooms make it almost impossible to incorporate modern kitchen design. Besides that this house was calling for a traditional farm style kitchen. 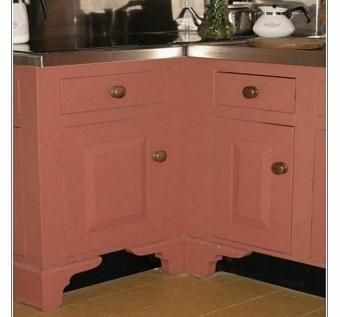 Farm kitchens comprised of Sideboards, Dish Dressers & Hutches. A heavy draw table often adorned the centre of these large kitchens as a preparation space. In this case my client has a draw table and the hutch unit only as shown in the composite photo/drawing. 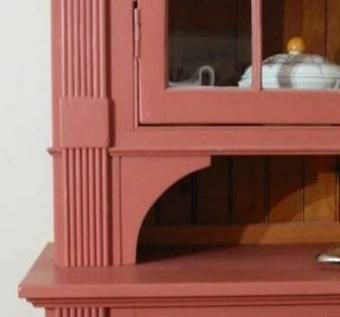 The 6" crown mould was partially missing and the pie shelf appeared to have been cut off to accommodate the solo use of the hutch. The original base unit had gone astray in its nomadic past. 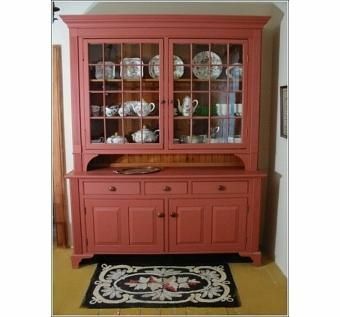 The end result was a restoration of the hutch and reproduction of the base unit. The pie shelf was added back on to the piece via internal king posts. It never gets more custom built than this.